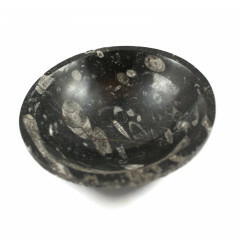 These fossils are commonly found worldwide – we sell a range of pieces from rough fossils, rough fossils on matrix, to polished pieces in decorative shapes and styles. Orthoceras, or “straight horn” is a type of extinct nautiloid Cephalopoda – a 400 million year old fossil. These fossils are common and occur all over the globe, occurring in almost any marine rock, especially in limestone. Unlike their spiralled ammonoid cousins these are slender, elongate shells ornamented by a network of fine ridges. 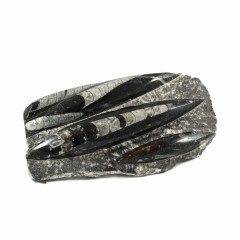 A massive amount of Orthoceras are found, prepared and polished in Morocco – usually with a dark matrix stone, and polished into a display item or statue. 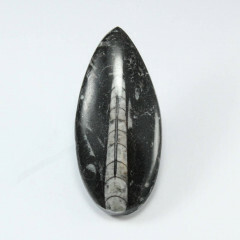 They are known for their excellent healing properties and are lovely stones to carry on your body or decorate your environment with. 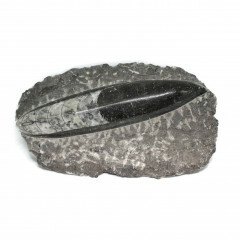 The healing properties of this fossil mainly relate to age related issues, such spinal or joint pains. They are thought to relieve arthritis and all skeletal system ailments. They are thought to simulate thymus and are related to the root chakra.